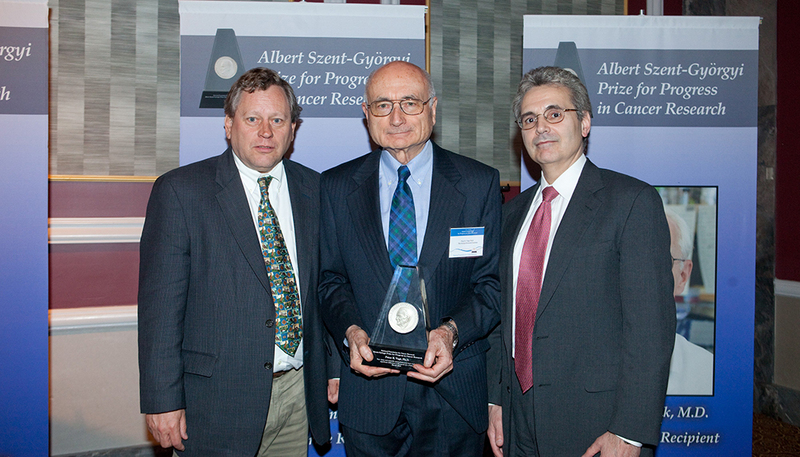 2010 Szent-Györgyi Prize Selection Committee Member Webster Cavenee, Ph.D., Winner Peter Vogt, Ph.D., and Selection Committee Chair Ronald DePinho, M.D. The term “game changer” didn’t come into English usage until 1993, and since then it has been driven into the ground from overuse. But when applied to Peter Vogt, Ph.D., it is more than just hyperbole or overzealous marketing. When you are talking about the person that identified src, the first known oncogene, a gene that can turn an ordinary cell into a tumor cell, thereby revealing that cancer has genetic origins, the superlatives actually mean something. Ironically, the discovery of src (pronounced “sark”) is a true case of discovering something by accident. When Vogt entered medicine in 1959, cancer research was a somewhat scattered field. The budding sphere of cancer immunology attracted few researchers and produced little results, and while it had been known since World War I that chemicals could cause cancer, most cancers were thought at the time to be viral in origin. Furthermore, Vogt set his sight on viruses, and not cancer directly. But then coincidence kicked in. Src had been discovered and the game had changed. Very quickly, Vogt and his colleagues dropped their interest in viruses and turned fully to cancer research. By identifying a genetic connection to cancer, Vogt steered the field into what has become doctrine today: Cancer is a genetic disease and it affects mutations and other changes in oncogenes, as well as the body’s natural tumor suppressors—oncogenes in cancer gaining function and tumor suppressors losing function. And it should come as no surprise that Vogt was the recipient of the prestigious Szent-Györgyi Prize for Progress in Cancer Research awarded by the National Foundation for Cancer Research in 2010. But while Vogt recalls his win with “gratefulness and surprise and tremendous joy,” even going so far as to call the event a milestone, this is not a man to gush (despite having several awards to his name going back to 1976). Rather than accolades, he would much rather speak of his ongoing research. A Professor at the Scripps Research Institute’s Department of Molecular Medicine and member of several academies, including the National Academies of Arts and Sciences and the American Academy of Microbiology, Vogt now focuses on a kinase family (types of proteins, specifically: types of enzymes), p110, which themselves are encoded by PK3C genes, whose mutations are known to be another major cancer driver. If he pried open one secret, he can pry open another. As one of the elder statesmen of cancer research, he can see what shifts oncology is going through now that make the job easier. Done, he says, are the days of animal models. Rather, technology has progressed so far that human cells are the templates. And he applauds the close integration between bench work and clinic work. And today, at age 86, he shows no signs of slowing down.